A tasty radish salad that is simple, light and nutritious, perfect for Indian summers. Hardly takes 5 minutes to prepare and hardly takes any effort. We normally eat this salad with rice as a side dish for lunch or dinner. You can also serve them along with chapatis and with other Indian flatbreads. I never ate radish until I got married!! It was banned in our house cuz of its smell. Like many other people I didn't like radish for their smell, until I tasted this amazing radish salad my MIL prepares. It's been my favorite salad ever since. You gotta try this radish salad, whether you like radish or not. Peel and grate radish. 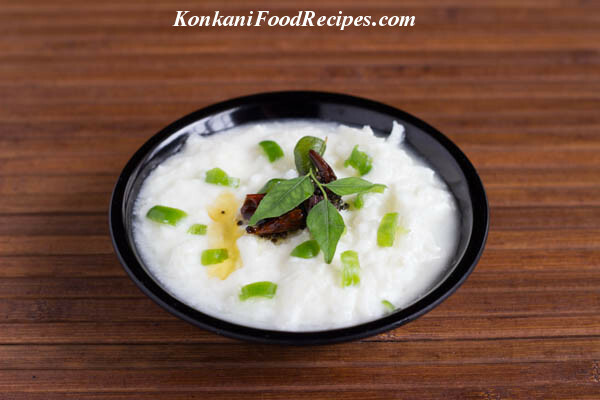 Add yogurt, salt, finely chopped green chilies and mix well. Seasoning the salad: For tempering, heat oil in a tadka pan, add in mustard seeds, once they start to splutter, add in pieces of dried red chilies, curry leaves and fry them for few seconds. Remove off heat and add this seasoning to the bowl with the radish mixture and mix well. Serve as a side dish with rice or with chapatis. This salad tastes great without the seasoning too. The seasoning adds flavor and taste to the salad. P.S: Do not grate radish and keep it aside long before serving, as radish gives out water and the salad becomes watery. Prepare the salad just before serving, or else instead of a thick salad you'll have watery salad, which may not taste that good. Add in thick curds if not you'll end up with a runny salad.